We put off the pesto making several nights in a row, only to finish babysitting an unhappy 8-month old and decide that "now's the time to make pesto." I was pretty pooped (after losing the poop - story to come later), but the Handyman was upbeat and energetic. He gets credit for that. Lots. There are some who say that the only authentic way to make pesto is to cut the leaves yourself, or, even better, use a mortar and pestle. Ladies and gentlemen, knock your socks off with either of those methods. Neither are for me. Not when I've worked all day, endured three hours of crying, and have half a winter's supply of pesto to make. 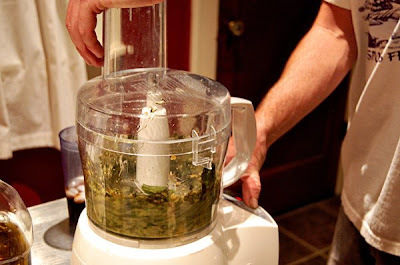 Just don't run the food processor too long or it gets soupy. 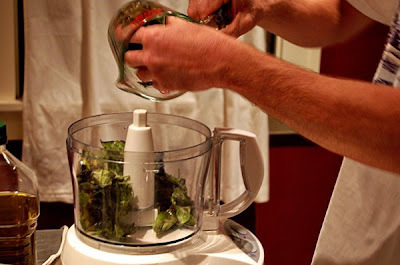 With the right finger on the button (the Handyman's), you can have pesto that has enough texture to look "authentic." As for the nuts, we don't use pine nuts. Unless your palate is super-sophisticated, you won't be able to tell the different between pine nuts and walnuts. 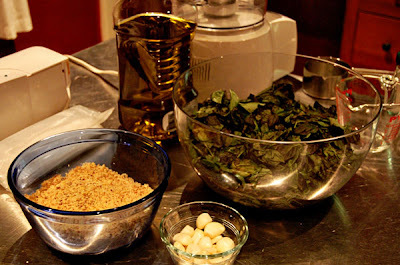 We ground the nuts ahead of time to avoid turning the basil and oil into soup. If you put the walnuts in whole, the other stuff gets overdone trying to grind the walnuts down small enough. I have a little two cup processor that I keep to the side during pesto-making that does the trick when our original estimate of chopped walnut needs runs out. It all goes in: garlic, basil, oil, salt, pepper, walnuts. We leave the cheese out because I've read that cheese doesn't freeze well. I've heard some people who leave the nuts out... or even the nuts and garlic and salt and pepper. They just grind basil and oil and freeze that. The advantage there is that you can add fresh nuts and garlic later. It all depends on how much freshness you like and when you want to do the work. I enjoyed what we did last year (before we heard about keeping the nuts and garlic out), and I really enjoy the convenience of being able to pull a package from the freezer, add cheese, and be ready to go. I don't have to dirty the processor again for nuts or garlic. It's all about what you prefer! 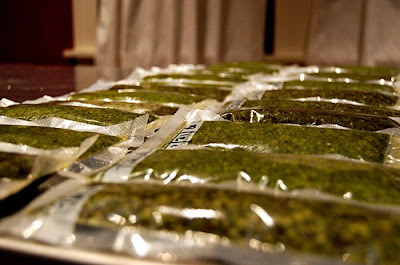 I've heard of some people using ice cube trays to freeze their pesto. They freeze the trays then take the cubes and place in ziploc bags in the freezer. Then you have a single serving, or several, whenever you need it. If I had ice cube trays on hand, I'd seriously consider it. Because I have a handy-dandy foodsaver that takes way longer than using ziploc bags. I shouldn't "bag" on the foodsaver, though. Yes, it does take a little extra time both on the prepping as well as the packaging. But, I do think the chance of freezer burn is a little lower, and, consequently, the freshness just seems much... fresher. If it's only in my mind, I'm okay with that. Since I'm the biggest proponent of the foodsaver and have worked out quite the system, I deal with all the packaging. It involves a funnel, a chop stick, and a lot of patience. Be careful when the bottom of the funnel gets slimy - it'll slip right out of your hand. The packages are great. There's enough for a pizza or a big batch of pasta in each one. 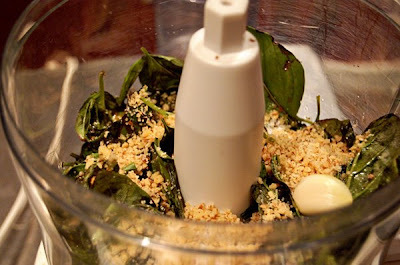 Each batch of pesto calls for 1/4 cup parmesan cheese. Since each batch fills about two and a half packages... well, you can do the math. When it comes time to use, I just add as much cheese as looks good. Which is a lot. Sometimes it requires a little extra oil. I'm okay with that. And, here's a hand shot just for scale. Now go make some pesto! You'll never go back to store bought after you do. I love me some fresh pesto!!! Sometimes I like to kick things up a notch and use different herbs: cilantro pesto, mint pesto and for a true Southern spin...Collard Green Pesto. 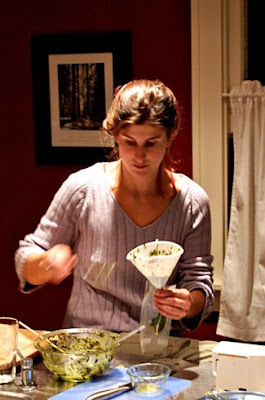 I have been making my own pesto for a couple of years now - it is SO much better than the store bought - even the fancy, imported store-bought stuff! 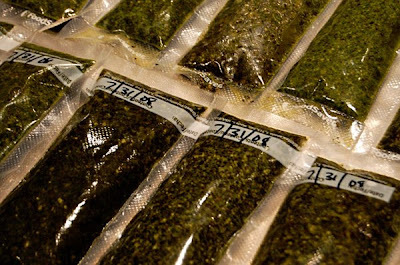 I didn't have a vacuum sealer, so I just used regular freezer bags making sure to freeze the pesto very flat and thin so that I could break off chunks that I wanted and stick the rest back in the freezer. 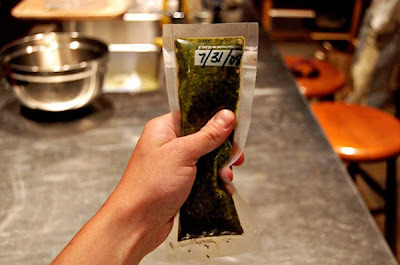 I'm sure that the vacuum sealed pesto would be much fresher tasting, though.